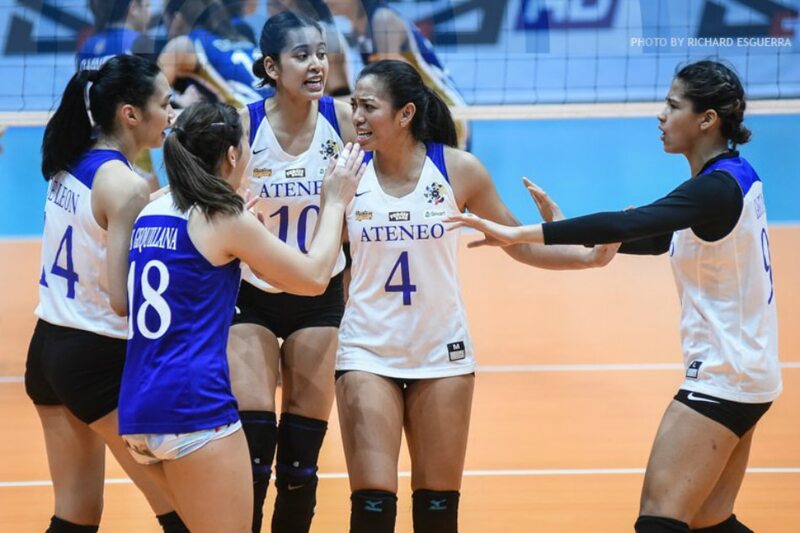 MANILA, Philippines – The Ateneo de Manila University Lady Eagles won their sixth game in a row on Saturday afternoon, but not before encountering a stiff challenge from the youthful National University (NU) Lady Bulldogs in the UAAP Season 81 women’s volleyball tournament. Behind the dominance of their middle blockers, Ateneo claimed a 23-25, 25-17, 25-23, 25-17 victory, giving them a 6-1 win-loss record at the end of the first round. It took the Lady Eagles nearly two hours to complete the win, however, as NU gave them all they could handle before fading down the stretch. Indeed, it was NU that drew first blood, out-executing Ateneo down the stretch of the opening frame. It was Ateneo that played below par in the first frame, as the Lady Eagles committed 13 unforced errors to help NU’s cause. But Almadro encouraged them to “play the right way,” and was glad that his players responded to his challenge. “‘Yung resilience ng mga players ko, lumabas sa second set,” the coach expressed. Afterward, the Lady Eagles could only commend the Lady Bulldogs for the tough fight that they put up. It was NU’s rookie pair of Princess Robles and Ivy Lacsina that again took charge for their team, coming up with 18 and 11 points, respectively. Kat Tolentino, who finished with 10 points, noted that the Lady Bulldogs were playing with a “nothing to lose” mindset – and it worked wonders for them. This kind of victory can only give the league-leading Lady Eagles the momentum they need heading into the second round, where they expect every game to be even more intense.